As I am sure many of you will already know, last week was a difficult one to say the least for my fellow citizens of Boston and Cambridge. The events have caused a debate here though about the use of advertising technology. 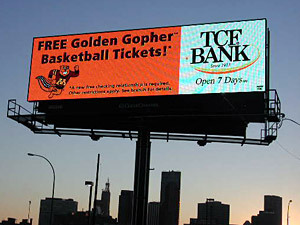 In the US many places host digital billboards. They are enormous, bright, attract attention and the content can be changed at will, using a computer and not a pole with wallpaper paste on it. Many change every 10 or 20 seconds, allowing great generation of revenue for both the publicity companies and the cities and states that license their use. I first saw something like these while watching the Premier League, boards that changed by the side of the pitch through a disk system, but the modern equivalent are just like watching giant TV’s, in HD quality no less. So why the debate? Well it turns out that the FBI have contracts with the largest billboard operators, and they can take over any number of the appliances and show what they want. In the case of Boston the contract is with Clear Channel Communications, and this allowed the FBI to show the photos of the two presumed bombers. Direct to the public marketing, for those of us still living without TV and smartphone (yes I am). But many groups argue that the billboards themselves are dangerous and present a distraction to drivers, and many are placed in residential areas causing numerous complaints. Light pollution as much as skyline destruction are both problems when they are placed in residential or historic areas. The City of Los Angeles has in fact recently taken many of them offline on these grounds as this article explains, and pressure groups exist that campaign for their removal. A Distraction or an eyesore? In all fairness they are not all trying to ban them, but to place them only in commercial districts where they do not cause distraction, but as you might imagine this does not go down too well. Distraction (or attention anyway) is after all one of their main goals. But there is a lot of money involved. The city of Chicago hopes to raise $155 million by placing billboards throughout the city. The City recently approved a deal as this article explains. The State of New Jersey has just struck down a ban on their use, again hoping to raise much needed funds. The FBI argue that they are useful tools in crime prevention, stating that they have already apprehended 51 fugitives after posting their faces on billboards, and insist on their position as a public good. The debate rages and I am sure will continue on for some time. The Scenic America website offers links to several safety studies regarding digital billboards for the interested reader. On a lighter note and thinking about my post last week I wonder if they are on Shodan and easily hacked? That might be interesting. We don’t really have these in the UK. 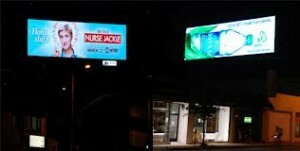 We do have billboards, but most of them are static. We have some which are static but rotate to show various different advertisements, but hi-tech LED hackable one’s aren’t common. I never knew that the FBI have access to them, I suppose if it helps catch dangerous criminals then it is a good thing, but do you think that if the government control such spaces, it could be argued there could be misuses? Thanks. I don’t see that having FBI access could lead to abuse. It reminds me again of Wall E, with messages appearing on TV and billboards about rogue robots. I live in a more rural area and so digital billboards aren’t used, but even regular billboards can distract a driver. There was one that was put up of a woman in a bikini, I think it was for a tanning business, in either case there were many complaints about how distracting it was to see a 50ft. bikini clad, tan beauty while driving on the highway…most of these complaints were from women but in either case the billboard was taken down and a more modest one put in it’s place. The point I am trying to make is, if something non-digital can distract drivers I can just imagine what digital billboards could do. Interesting story Ron, thanks for sharing. I suppose that static billboards probably aren’t used to help catch criminals are they?